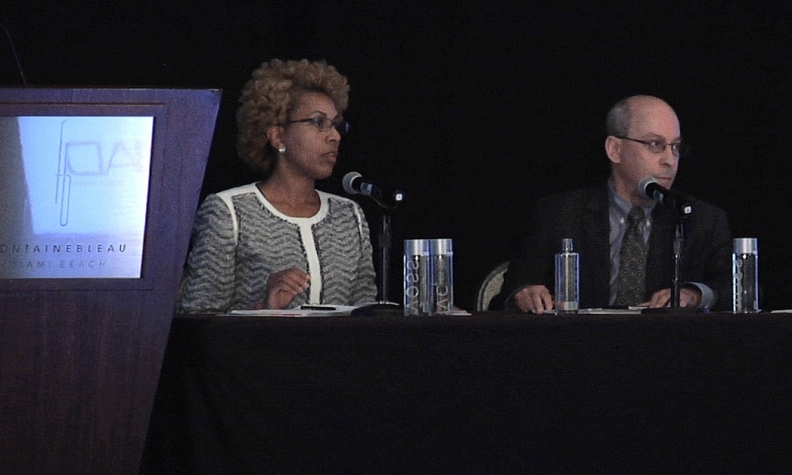 Patrice Ficklin, left, the CFPB's assistant director for fair lending and equal opportunity, and Steven Rosenbaum, chief of the housing and civil enforcement section of the Department of Justice's Civil Rights Division, under fire from some dealers last week in Miami. MIAMI BEACH, Fla. -- The room was nearly packed when a senior official from the Consumer Financial Protection Bureau and a colleague spoke at the annual conference of the National Association of Minority Automobile Dealers here on Wednesday, July 8. It was the first time for a CFPB official to address dealers directly in public. The agency, which by law has oversight over lenders but not dealers, has sent officials to lender conferences -- but not to dealer gatherings. But if Patrice Ficklin, the CFPB’s assistant director for fair lending and equal opportunity, and Steven Rosenbaum, chief of the housing and civil enforcement section of the Department of Justice’s Civil Rights Division, thought the reaction from the mostly minority audience would be warm and fuzzy, that wasn’t the case. Conference attendees let them know that dealers, including minority dealers, feel that the agency is coming after them. Here are a sampling of the exchanges. While the agency has cited flat fees as one way of reducing the risk of discrimination, Ficklin stressed that flat fees aren’t the only way auto lenders can pay dealers for arranging loans. “There could be a variety of possible alternatives,” she said. He later explained that he had “jokingly” said his agency, as part of the Justice Department, can sue dealers because it has the authority to investigate them and enforce the Equal Credit Opportunity Act. Both Ficklin and Rosenbaum said most of the problem stems from the discretionary buy rate. Also known as dealer reserve, that is the additional interest rate, above the lender’s buy rate, which is the share of a car buyer’s interest-rate payments that the dealership earns for arranging the loan. They said borrowers typically don’t understand they can negotiate the difference between the buy rate and the final rate. He questioned what direction is being given to F&I professionals and whether dealers have policies about when to mark the buy rate up or down and terms of negotiation. He also asked them to consider how they train employees on policies and if they monitor the results. “That’s the basic idea behind having a compliance management system,” Rosenbaum said. The lower-cap model, he said, also would allow the lender to have a lower cap, which could affect the individual borrower’s contract rate, and a flat fee on top of that. “I can say with some confidence that the systems that we are describing can be executed in a way that don’t affect individual dealer compensation,” he said. When the Q&A period began, a dealer wanted to know whether Rosenbaum was suggesting that dealers should have some type of audit system to monitor the spread that dealers charge consumers. For example, say an F&I manager has a maximum or cap of 2 points that he or she can charge. Some customers are charged 1 point, some 1.5 points and others 2 points. The differences are based not on creditworthiness but on the manager’s ability to get customers to say yes to the payment. Is that a violation? Rosenbaum said yes. “You should be monitoring it because it could be exercised in a way that produces disparities based upon race or national origin in your customer base,” he said. Another dealer pressed Rosenbaum further. “Being minorities, we don’t want to see discrimination happen,” he said, “but is it our job to inform the customer, ‘By the way, you can get 6 percent’? Another dealer challenged Ficklin’s statement that the CFPB doesn’t oversee dealers. Once a quarter, he said, “they come in with their documentation” and “they go contract by contract, and if we’re off at all then we have to bring that into line. Ficklin stood her ground. “I am not trying to get to you. But I would ask you, would it be fair for me to turn my head from the discriminatory outcomes of lenders’ policies? Part of my obligation is to enforce the Equal Credit Opportunity Act. Then things got a bit testy.